Plan-A Productions (http://www.facebook.com/pa​ges/Plan-A-Productions/179​735275414887) brings you, for the first time in Pakistan, a theatrical production of V for Vendetta. V for Vendetta is a 2006 dystopian thriller film directed by James McTeigue and produced by Joel Silver and the Wachowski brothers, who also wrote the screenplay. It is an adaptation ...of the comic book series of the same name by Alan Moore and David Lloyd. And now is being made into a theatrical play by Plan-A Productions which is directed by Mustafa Changazi and co directed by Mallika Rangoonwala and Aseem Rizvi. The story is about a shadowy freedom fighter known only as "V" who uses terrorist tactics to fight against his totalitarian society. Upon rescuing a girl from the secret police, he also finds his best chance at having an ally. From graphic novel to film; and now V for vendetta is set to be told on stage. 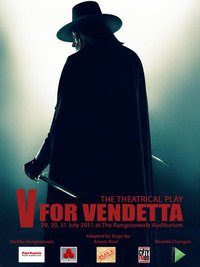 Plan A Productions brings to you for the first time ever brought on stage, V for vendetta! !